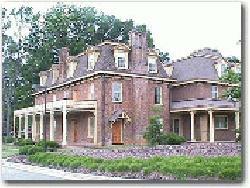 The Page-Walker Arts & History Center was built as a hotel in 1868 by Town of Cary founder Allison Francis Page. In 1979, the Page-Walker Hotel was listed on the National Register for Historic Places. In 1985, a citizens group, Friends of the Page-Walker Hotel, joined with the Town of Cary to save the deteriorating building and restore it as an arts and history center. Today, the center is alive with classes, events, performances, meetings and receptions and the gallery exhibitions feature works of local and regional artists. Features: Cary Heritage Museum, Gallery exhibitions, Furnished parlors, Catering kitchen, Brick courtyard, Educational rooms, Archive gallery, Smokehouse, Garden.